Every sail has a story, it has shared joy, fear and sadness with the boat and its owners, it is not just a piece of cloth. It is a world, full of life and adventure. Every product we make is truly unique, no two are identical and each will be made of different sails, with different stories. It is somewhat comforting to sit on the beach, protected from the wind by a sail which may have taken its owners round the cape of good hope, across the Atlantic Ocean or just sailed along a river. 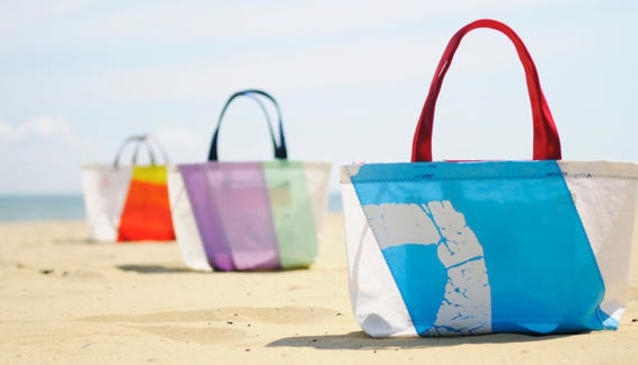 Each bag is different depending on what sail cloth we have in stock, but all will follow as closely as we can the designs you see in the images. If you have a specific colour you would like, please let us know and we will do our best to accommodate. All of the bag is made from old sail cloth, or cut offs from sailmakers that would otherwise be thrown away. The same applies for the handles/straps which is new or recycled webbing or other material that would otherwise be thrown in the bin. If you have old sails and you would like some bags made from them (or anything else for that matter), please call us and we can help. It is akin to sail retirement and we treat our sails with respect. All our products are hand made on the Isle of Wight.